On those cold evenings when you are relaxing with your friends and family, the way to keep yourselves warm and cozy is via a stylish gas fire pit table. 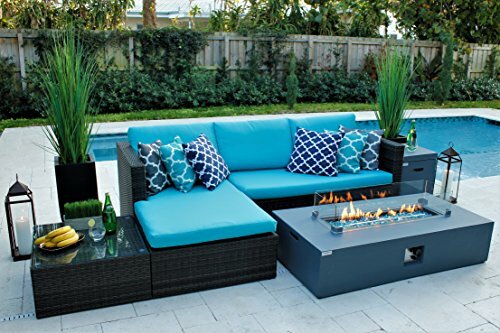 A gas fire pit table, in the simplest terms, is a portable propane gas tank connected to a burner in a concave bowl or basket in the middle of a very stylish table meant to provide warmth in your patio or backyard. Over the years, fire pits have become a part of many outdoor and patio decorations because they blend in quite well. Apart from their style, they do not emit harmful smoke and do not require you to stock up wood and charcoal to fuel them because they run on propane. Whether it’s your first time or you’re looking to upgrade your fire pit, it’s always a hassle deciding which one to pick because of the vast varieties in the market. 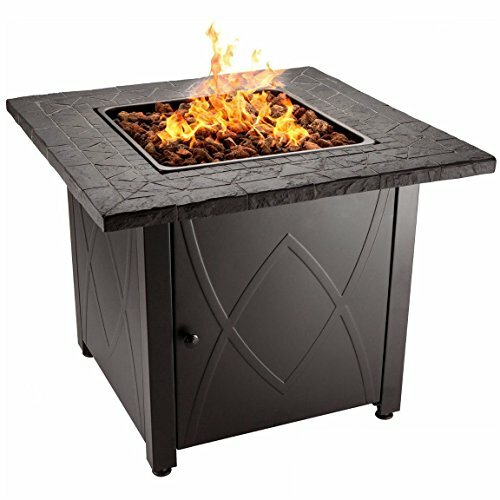 For this reason, we decided to compile a list of fire pit tables based on their characteristics, reputation, consumer reviews, and their overall rating. Read through the review to find the fire pit table that fits perfectly with your outdoor setting. This set is for a well-designed outdoor look. AKOYA Outdoor Essentials offers the fire pit table as the centerpiece for a patio furniture set. It’s an elegant combination which gives your patio an outstanding, unique look. The pit table is made of fiber concrete and steel with an all-weather finishing which increases its outdoor durability. The fire pit table measures 56” long, 28” wide, and 15” high. This makes it perfect for an outdoor dinner setting as it has enough space. It’s low enough to allow a good radiation flow of the heat to keep you warm. It comes with 20 lb liquid propane tank which burns propane to produces 50,000 BTU’s of heat. You can either set it to burn at a high rate for more heat or a low rate in case you require little heat. At high rate setting, it has 10 hrs burn time and, 28 hrs burn time at low setting. It comes with a glass guard and a protective cover which helps to keep kids away from the fire and prevents other things such as utensils from falling into the fire pit. The GDF square fire pit measures 34.5″ by 34.5″ in length and 24″ in height. It has enough space to accommodate just a few utensils at the edges. Its natural Magnesium Oxide stone is durable and can withstand any weather making it a perfect addition to your outdoor furniture. The finishing of the GDF studio fire pit table adds a unique style to your patio. This fire pit burns to produce 40,000 BTUs of heat which is pretty comfortable to provide warmth for your family when having an outdoor dinner or during a small gathering. It also has different burn rate settings which allow you to regulate the amount of heat produced as per your requirements. The Blue Rhino fire pit table measure 33″ (L) by 30″ (W) by 24″ (H). The fire pit itself occupies most of the space leaving about 3 inches for placing utensils. The table is made of steel which is not stainless meaning it can rust after a while. Although it comes with a plastic protective cover to put on the table, the steel is still prone to rust. The Blue Rhino gas fire pit has a safety valve and a Piezo ignition system. Piezo ignition system ignites the pit by merely pressing the ignition button. The safety valve ensures that you’re in full control and protects you against any incidences in case of a malfunction. It accommodates a 20lb propane gas tank which fits under the table and is well protected and concealed by the steel table. The pit burns to produce 30,000 BTUs of heat which is only enough to keep a few people warm. 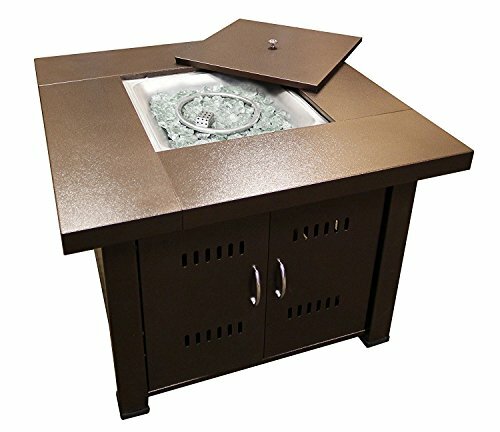 The fire pit table blends well with your patio as the propane tank and control panel are hidden, and it has a smooth finish. 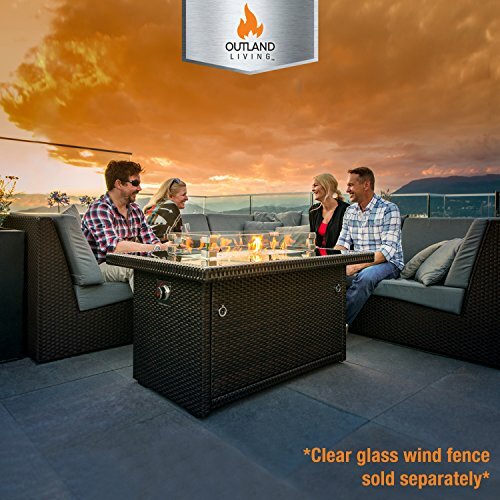 Outland Living series 401 fire pit table has an elegance that blends with any outdoor setting that you have, making it a unique addition to your outdoor furniture. The table measures 44” (L) x 32” (W) x 23” (H) providing enough space for placing utensils during meals. The material used to make the Living Series 401 is weather resistant increasing its durability. Its frame is made up of powder-coated aluminum which is weather resistant and robust to offer support to both the propane tank and the fire pit. It has an automatic ignition system eliminating the need for manual lighting. The base of the table accommodates a standard propane tank of 20lbs and conceals it in style. The burner and burn pan are made of weatherproof stainless steel making it perfect for an outdoor setting. Its protective glass guard prevents the flames from being blown around by the wind. The fire pit has a glass lid that lets you convert the table into a full-service table which is helpful when you want to set dinner or drinks and do not require the fire. It burns to produce 35,000 BTU providing enough warmth as you relax in your patio. The valve gives you control over the burn rate to reduce or increase the surrounding heat. Endless Summer GAD1401M gas fire pit is made of weather resistant steel and tile mantel with a sleek exterior coat. The coat is durable, and it gives the table an eye-catching design that blends well with outdoor settings. The top measures 30” by 30” providing extra space to place a few utensils as you enjoy the warmth. The woven steel base stylishly conceals a 20lb propane tank and offers easy access when you want to switch out the tank. 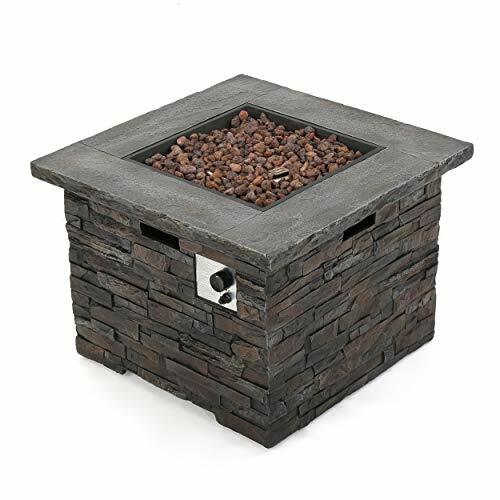 The fire pit is easily ignited by an electric ignition system which comes in handy. It burns to produce 30,000 BTUs of heat and allows adjustment depending on the heat requirement via a hidden control valve. Belleze elegant fire pit table is composed of strong weatherproof aluminum. The table measures 50.5″ (L) x 35.75″ (W) x 23.25″ (H). The burner unit occupies 31.5″ (L) x 14″ (W) which leaves enough space along the edges for your use as you enjoy the warmth it produces. The fire pit has a bronze finishing which blends well with any patio and gives it a cool look. It’s a great centerpiece for any outdoor setting. The fire pit is compatible with a 20lb propane gas which is well concealed under the table and easily accessible through a side door whenever need be. It produces a massive 40,000 BTUs of heat which is enough to keep a gathering in the backyard warm as they have fun. It has hidden controls which include an automatic ignition system and a knob to adjust the flame. It comes with clear fire glass beads which illuminate the flames creating even a more stylish fire pit. The pit comes with a lid that is used to cover the fire bowl converting the fire pit to a full table when the fire is not needed. 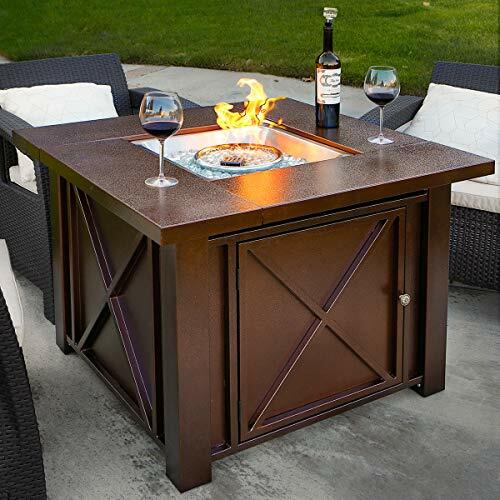 XtremepowerUS fire pit table is ideal for an outdoor setting as its style and color compliments any existing patio or outdoor furniture. It’s made of tough weatherproof steel which protects the table from any damage. The table’s base can hold a 20lb propane gas tank which is connected to the burner using an enduring gas hose. The propane tank is accessible through a side door in case you want to replace the tank. The addition of an ignition system makes it easy to light up the burner producing up to 40,000 BTUs of heat which creates a warm outdoor setting. The flame can be adjusted accordingly via a hidden control panel. The XtremepowerUS fire pit can be covered to transform it into a dining table. It has safety features such as a thermocouple flame failure device which cuts off propane gas supply when the flame is extinguished, or when the ignition system fails. 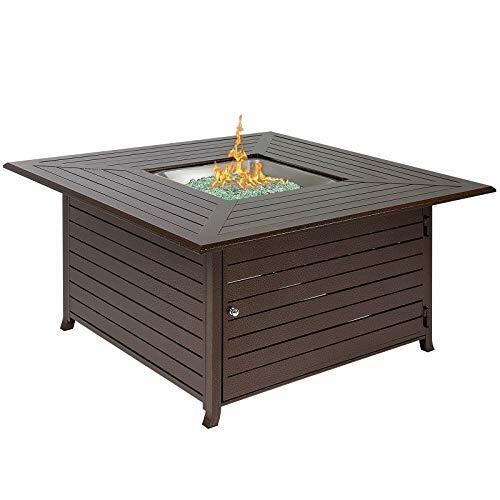 The Rogers fire pit table is circular with a diameter of 32” and 24” in height. It’s composed of magnesium oxide and steel which not only gives it durability but also enhances your outdoor style. The materials used to make this fire pit are weatherproof and can withstand extreme heat. To expand its durability even further, it comes with a PVC cover to protect it against elements. It easily fits a 20lb propane tank under it that can be effortlessly switched out when necessary. For its size, it produces a lot of heat at 40,000 BTUs enough to keep your patio warm enough. It has an automatic starter button to ease the process of lighting the burner and a regulator to control the flame size accordingly. Its small size makes it great for a patio with small space as it takes up very little of your space. Its style easily blends with any outdoor setting. The Best Choice fire pit table provides elegance, warmth, and durability. The table is 45″ by 45″ in length and 23.5″ in height which makes it big enough along the edges to accommodate enough utensils during a dinner setting. It’s made up of extruded aluminum which makes it weatherproof and sturdy. It has a dark brown finishing which gives it a beautiful color to blend with your patio or backyard. The base can hold a standard propane tank of 20lbs and has a door for easy access. The propane tank is well concealed keeping the fire pit table looking classy. The fire pit contains glass beads which help illuminate the fire once the pit is ignited. The pit burns to produce 42,000 BTUs which keeps the yard/patio warm enough. The heat can be adjusted as required via a flame control found on the hidden control panel. One feature that comes in handy is that it’s multifunctional. The fire pit can be lit up to provide warmth or can be covered to use it as a centerpiece table. It comes with a nylon protective cover to protect the table from rain and other elements when not in use. 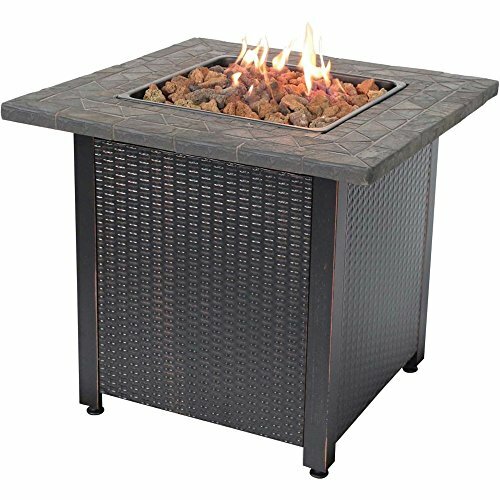 The AZ fire pit table is made of bronze colored steel which is sturdy and elegant. The antique bronze finish of this fire pit table gives it a unique look which blends with many outdoor or patio settings. The size of the table, i.e., 38” by 38” in length and 28” in height makes it a great centerpiece. The fire pit does not take much space leaving enough edges to place utensils during a dinner setting. It can also be covered with a matching lid to make it a full table when the fire is not needed. The base provides enough space to fit a 20lb propane tank which is connected to the burner in the fire pit to give a heat output of 40,000 BTUs. The burner is ignited by Piezo ignition system which works well even in cold temperatures. The burner has a thermocouple failure device to cut off the supply of propane gas in case the flame goes off. This prevents accidents and wastage of fuel. 1) Ignition system: There are three types of an ignition system, i.e., manual ignition, spark/piezo ignition system, and an electrical ignition system. The manual ignition system involves turning on the gas flow and then manually igniting it using a match or a lighter while the Piezo and the electrical ignition involves flipping a switch and a spark lights the burner automatically. 2) Size and design: Buy a gas fire pit table that blends with your existing outdoor setting. Check out the amount of space it occupies to ensure that it doesn’t take up too much space of your patio in case you have limited space. Consider buying a multifunctional fire pit that can be used as a centerpiece in your patio. 3) Safety features: Gas fire pits are an essential addition to our backyard, but they can cause injuries if they’re faulty. 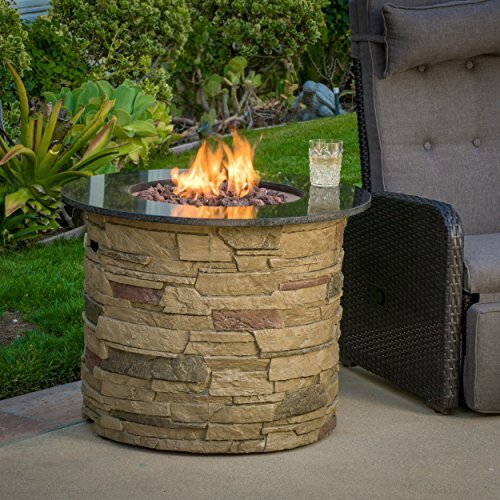 Always make sure the fire pit table that you buy has been certified to be safe and has other safety features such as an emergency shut-off valve and a thermocouple flame device. This keeps you safe as you enjoy your outdoor life. 4) Tank size: Most fire pit tables have a standard 20lb propane gas capacity which is compatible with burner rings of up to 20″ in diameter. Larger burner rings require larger propane tanks. There are also small fire pit tables which fit a smaller tank, i.e., less than the 20lb LP standard tank. 5) Portability: Buy a gas fire pit table depending on the intended use. If you’re to use it on the go, buy something light and small enough to carry around. 6) Heat output: This is measured in BTU (British thermal unit). The more the BTU value, the larger the area it can heat. Buy one that can heat almost your entire backyard so that you and your friends can enjoy the warmth from anywhere within the yard. 7) The material used to build it: if it’s a gas fire pit that will be left outside, ensure it’s composed of weatherproof material to protect it from elements. Materials such as stainless steel, magnesium oxide stones, and powdered aluminum are very durable and are weatherproof. The amount of BTUs required depends on the size of the patio or backyard you are planning to use the fire pit on. The larger the size of your yard or patio, the more BUTs you will require. How long does the propane tank last? Three factors usually determine how long a propane tank lasts, i.e., the burn settings, size of the propane tank, and the size of the burner. The standard propane tank (20lbs) can last for an average of 11-12hrs on high burn rate settings. How do you increase the size of flames in a fire pit? One easy way to increase the size of the flames is through a dial-up on the control panel. Other ways to improve the flame size is by making sure that there is adequate airflow and the decorative logs and beads do not block the burner. How far should the fire pit be from the house? The rule of the thumb is that any fire pit should be at least 10 feet away from any combustible objects and structures. In this article, we have taken you through the features, pros, and cons of some of the best fire pit tables. Fire pits are great but can also be dangerous, and safety measures should always be put into consideration when using one. We hope that by the end of this article, you were able to choose one that best fits your requirements.